In the United States, if you showed up on someone’s doorstep with a cow, the response elicited would not likely be one of gratitude. It would probably go more like this: “Um, what am I supposed to do with that?” (Looks around the yard. Neighbors peer skeptically). But in the small Armenian village of Khachik, giving someone a cow is sort of like giving a choking person the Heimlich maneuver. So when Heifer Armenia first came to the village in 2009 to give cows to families, you can imagine their excitement. They weren’t just getting cows – They were getting resources to generate income, a way to feed their families and the opportunity to stay in their native land rather than migrate to big cities in search of higher paying jobs. Of course, they aren’t just “getting” the cows. Anyone who’s every tried to take care of one of these animals knows it’s hard work, so Heifer Armenia also provides training sessions. Sound familiar? It’s like The Fuller Center’s Greater Blessing program, but with cows. In fact, it just so happens Heifer Armenia came to partner with The Fuller Center by giving Fuller Center families a way to make payments on the house over time, which will in turn go toward the construction of another house for a family in need … which will in turn help build healthier families and communities. Whoever thought cows could help make such a difference? "We can proudly say that house construction is not the only way of helping the families to rehabilitate after years of need and homelessness. Fuller Center for Housing Armenia, in partnership with Heifer Armenia, is implementing a program that helps the beneficiary families to establish small farms by providing them a pregnant heifer on condition that the first calf will be passed on to another needy family after three years. Giving resources to the families who already have their own decent house Fuller Center for Housing Armenia together with Heifer Armenia give them the opportunity for life betterment: imagine families who once dreamed of having a decent home are also given the opportunity to live better. This is also a good way to enable them pay back the zero-interest loans (only by selling the 60 % of the milk, they can pay back the loans). The project is enlarging, and now we also provide families with sheep and bees. Up to now 100 Fuller Center for Housing Armenia beneficiary families were provided with cows, 42 families with bees and 15 families with sheep. This partnership really makes difference in the lives of many Armenian families. 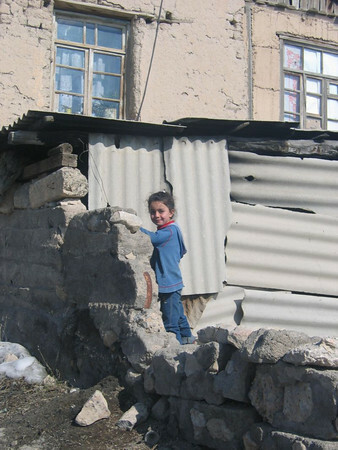 This is another good way of eliminating poverty and developing sustainable community in Armenia."